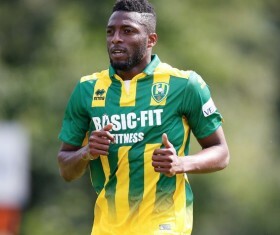 Everton are ready to complete a deal to sign 24-year-old Ivory Coast international defender Wilfried Kanon from ADO Den Haag of the Eredivisie. The Dutch club will sell the 6 foot 2 centre-back for a reported 7.9 million euros transfer fee. Kanon, who made the move to Italy at the age of just 16 playing for Empoli's youth side, then went to Romania to play for Gloria Bistrita and Corona Brasov. An array of impressive performances by the defender helped push through a deal to move to the Netherlands where Kanon is now regarded as one of the best up and coming defenders in the league. It is understood that Everton manager Sam Allardyce is seeking a long term replacement for Phil Jagielka and will move to sign Kanon as a cut-price alternative to the former England international. Kanon has two years remaining on his deal with ADO Den Haag and has also caught the eye of Dutch clubs Sparta Rotterdam, PSV Eindhoven and Feyenoord.